getting used to, they will fit perfectly into my wardrobe! tell you all how excited I am to get to Philly. So many adventures ahead! Hope you are having a lovely, and possibly lazy Sunday! That's a really nice outfit, and I love those platforms! I don't tend to wear high heeled or platformed shoes, because I'm really tall and they make look even taller and then I feel like a giant. I love your blog! You lucky girl! Love those new shoes of yours. JC's are fab! You always have the cutest outfit posts! love the look!!! cute top & shoes!! Definitely some great summer essentials. You look fabulous as always. :) And congratulations on graduating! Getting the internship, heading to Philadelphia... it sounds like a ton of exciting adventures are in store for you! I'm loving all things crochet this season as well. But most of all, I am enamored with your JC El Cajon wedges. Such a perfect summer look! Wishing you the best with your UO internship, hun! those platforms are so sweet, gorgeous outfit too bonnie i love that bag. Wow. Those are some big platforms! I love platforms, since I can actually walk in them compared to heels haha. Cute bag. These JCs are awesome!!! Great summer shoe! First of all congrats on you graduating! Can't wait for that day to come for me, second those platforms are amazing, love the crochet top looks so much like summer! Oh Gosh! I love your heels girll!! They are impressive (and beautiful!) I love your bag too! That crochet top is so so so gorgeous! this is so lovely dear..
love your top..and your shoes are adorable..
love your tank and wedges! Your wedges look amazing!! Are they really heavy? Wow! Those platforms are awesome! I'm just wondering...how tall are they?! Your outfit totally personifies summer! I love your platforms, though I would probably topple over :) Looking lovely as usualy! gorgeous top! and i love those platforms :) you look as pretty as always! So cool you are done with college! Those wedges are incredible! I love your crochet top as well! You look as pretty as always Bonnie! Oh wow those shoes are amazing!!! They are irresistible and gorgeous :D You look great in this outfit. I am so excited for you and your internship, I am sure you will do great! Hope you had a good day yesterday! gorgeous top and love your wedges! Your internship sounds amazing. I'm loving those wedges. I bet Philly will be awesome during the summer. This outfit is really adorable :) I like the crochet top! Pretty! And that handbag is lovely. love it!!! the wedges are amazing!!! Congratulations for your graduation Bonnie!!! Congratulations on graduating!!! I hope that your internship goes well! I really like your outfit! It's adorable, especially the knit tank. Such a "summer music festival" touch. Congrats!!! I love that bag!! Bonnie I love your blog.Everything what you wear is amazing and this look really vintage! I love love you! I believe I just gasped with enjoyment due to your beautiful outfit! 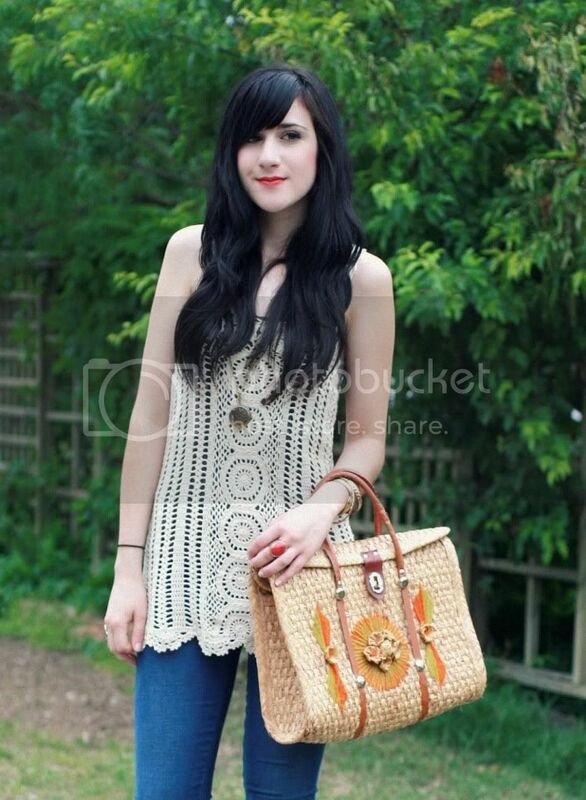 I love the crochet top paired with those perfect platforms and THAT bag! congrats on graduating, I just got teary eyed since this month marked a year since I graduated! ahh! - apart from the platforms, id break my neck in platforms. Gorgeous shoes! I wish I could strut around town in platforms, but I'm 5'10" and I'd look like a giant Amazon woman! Such a great place to intern, wish you all the best there! 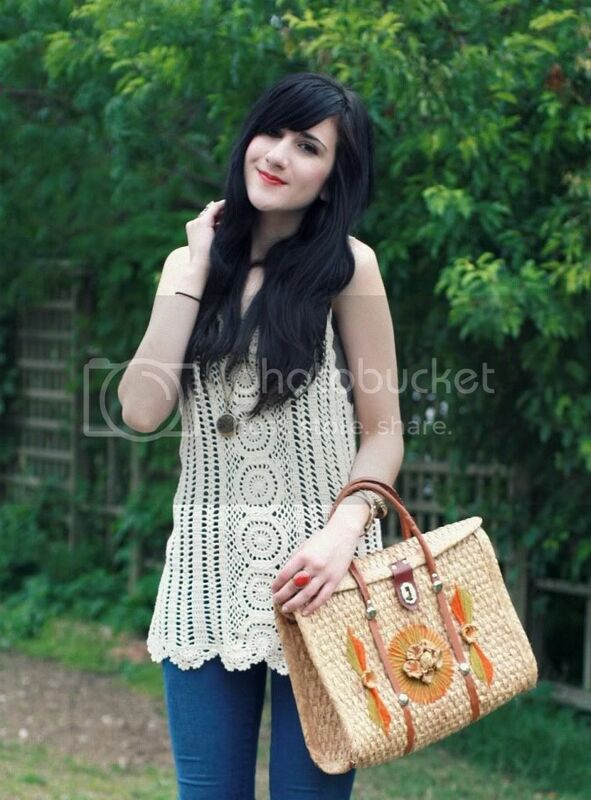 Such a cute crotchet top, and those shoes are soo gorgeous! amazing outfit love the shoes! Those are some serious shoes! Good luck on your adventures, I'm sure you'll soon be having so much fun you forget all about university! Congrats on your graduation!! I love Philly, it's such an awesome city. Those shoes, while rad, look treacherous. those shoes are so you, bonnie! i am so excited to graduate! we are all grown up now! Congrats on graduating and joining the "grown up" crowd! I'm excited to also see your adventures in Philly. And I'm also loving crochet pieces too though I don't have any in my wardrobe at the moment. I'm hoping to change that soon. ah i have that top!..forever 21 last year lol. thanks for checking out neusparkle. Super cute top and i Love your jeans ! Love this look especially the platform clogs. oh j'adore ce que tu portes, j'aime beaucoup le crochet, et tes chaussures sont superbes. Your looks are amazing! I love the combinations and the long skirts..
Are you a fashion student as well? I would like to do my internship in Londen, do you know any adress or maybe a nice magazine I could work for? Oh, so sorry thought you where from England but you're from the states haha..
Love the crochet top, and LOOOOVE those JC platforms! The colors paired with the wood, so chic. I am in LOVE with this outfit! I especially <3 the shoes! what did you major in??? Oh wow how adorable are those wedges?! The colours are amazing!